Ooooh, I love this. Looks like a cool, clean, unspoiled place. I'd like to go there. Draw a bus that goes there! And a ticket! i really like the scene, colors you used and the pine trees good job, it is a very pleasent picture. OMG I LOVE THIS!!! It is so relaxing it. I want it in my living room. ...you said ... to go there. 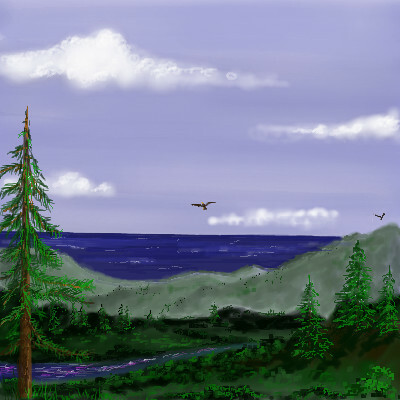 LOL There is alot of depth to this and I love the way you did the pinetrees. so much to look at in it. :D Wow and that is amazing when you look at the other versions too. Thanks..I'll ask emmamommalag to draw you a ticket to it also..
No tickets.. it's not on the busline. That would destroy the serenity. I love your landscapes poppa...so beautiful! Great color of green you chose also! You can only get there by hot-air balloon. Too cold!! ?? Where's your sense of adventure? beautiful. I wanna dip my feet in that stream. this is absolutely lovely poppa! !